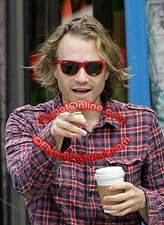 OMG, Could Heath Ledger look any fuglier? Seriously, those shoes are horrible. I know that MK has worn them, but even Shopbop is trying to get rid of them. Maybe Heath is a Method actor and that's why he looks so Joker-ish or maybe that's not Heath at all -- the paps could've mistaken a cracked out artist for the actor. Oh yes, he looks totally fugly. Phew, you just know he smells, phew!